DWI (driving while intoxicated) is a serious charge. There are many ramifications, including expensive surcharges, driver license suspensions, jail time, court costs and fines, and of course, a permanent criminal conviction. With a first conviction, there are increased misdemeanor penalties associated with a second DWI, and felony prison time for a third. 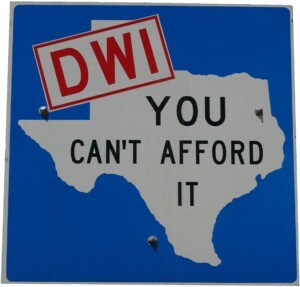 DWI is the single most common misdemeanor charge in Harris County, Texas. Thus many people find they need legal representation for a DWI. Perhaps you were attending an office function, and you had a drink or two before you drove home unimpaired. Or, before you knew what happened, you had one too many drinks. Maybe you were meeting with an important client and felt pressured to keep up with his or her good-natured drinking. Perhaps you were not drinking at all but were merely tired from overwork or lack of sleep. If it so happens that you are stopped by a police officer, and they suspect you may be over the legal limit, they usually ask pointed questions such as how much did you have to drink, where were you drinking, when did you stop drinking, and the like. They will typically request that you perform a series of field sobriety tests. The three tests recognized around the country as standard for an intoxication investigation are the “HGN” (horizontal gaze nystagmus), the one leg stand, and the walk and turn. These are tests require the subject to make abnormal movements, yet are used to determine if the subject is behaving abnormally. They are rigged in favor of the government. Almost invariably, you will be arrested for suspicion of DWI, and then asked to give a breath or blood sample. Don’t do it voluntarily. You will be charged with DWI whether you give them what they want or not. In any event, you will need a reputable DWI defense attorney. What does a DWI attorney do? A good defense attorney knows that the prosecution will have to prove that the person charged was driving the car and that the driver was under the influence at the time the car was operating, not at the time the breath or blood sample was obtained. The qualified defense lawyer will attempt to prevent the prosecution from proving its case to the required degree of certainty. There are many factors involved with the method in which a defending attorney will present a solid defense. 1.) The arresting officer did not have justification to make the stop. Evidence procured after an improper stop, like admissions or breathalyzer results, could be inadmissible in court and cause the state to be unable to make its case. Was the driving the officer observed actually against the law? 2.) Behavior that suggests intoxication but which can be explained for unrelated reasons. Did the driver have a medical history that impacts their ability to perform the police sobriety exercises? 3.) Conflicting witness reports – The arresting officer will almost always offer an opinion that the person was intoxicated. Can someone else affirm that you were not drinking alcohol before you drove, or that you appeared sober beforehand. Their testimony could refute police accounts to the contrary. 4.) Attacks against the reliability of the breath or blood results. – Chemical tests produce a number that is supposed to represent the alcohol concentration in the blood. The qualified DWI defense lawyer is trained to teach the jury that this number may not be an accurate reflection of reality. Scientific instruments get out of calibration. Human error can be introduced. Storage inadequacies can compromise a blood sample. Even the initial technique of the nurse’s blood draw can affect the accuracy of the end result. The attorney will pursue discovery of evidence including witness statements, official police reports, lab and machine records, as well as any video or audio files relevant to the case. If there are valid arguments to be made in your defense, an experienced DWI defense attorney will identify them and then pick the ones most likely to carry the day. The defense explores the entirety of the case, from the initial criminal charges to the jury instructions, all to ensure legality. They will make every effort to provide the very best representation and defense possible. If this is a first-time experience, you can expect to be confused, possibly fearful, and likely overwhelmed. Try and remain calm. You do not have to talk or make a plea without an attorney present. You will be given an opportunity to speak with legal counsel, and you should do so immediately. Should you decide to fight the arrest, it is imperative to use an attorney with DWI defense experience, one familiar with the court system, prosecutors, and judges, and one that will understand the nuances of navigating the system and how to present the best defense. Above all, take your time in selecting a lawyer. You want to hire an attorney that makes you feel comfortable and inspires confidence. A DWI case has more to it than driving while intoxicated. Guilty or not, DWI charges are grave. If convicted, you will have a criminal record and a permanent mark on your driving record. If you have had more than one arrest, your license could be suspended or revoked, and you could go to jail. The ancillary impact can affect employment, the price of automobile insurance, and more. The situation is often traumatic and overwhelming, but having proper representation can make the process easier and offer some peace of mind.